During the Cold War, Russian poets, among them the future Nobel laureate Joseph Brodsky, emigrated from the Soviet Union and cut all ties with Russia. Today, Russian poets of a new generation are closely engaged with their homeland as never before. The verse of Alexander Galper, a Russian poet from New York, is a combustible mix of Charles Bukowski, Allen Ginsberg and Woody Allen, with a dash of Daniil Kharms’s absurdism. His amusing, sharply political and evocative texts have attracted the interest of critics in Russia and translators in the United States. Galper has been living in the U.S. for nearly 25 years, after spending the first 18 years of his life in Kiev. “God gives all people some sort of talent,” Galper said, “but he does not always send them where the talent is needed. So people need to battle with this hostile reality.” And so Galper does, in his own way. Since moving to New York, he has had an eclectic career. He studied at Brooklyn College, where he majored in creative writing. He also sold toilets; worked as a taxi driver and computer programmer; and become a social worker. In his free time, he appears as an extra in scenes of Hollywood movies. Galper is part of the circle of poets of the “Novaya Kozha” ("New Skin") journal, known as Koja Press in English. “We have published the older generation—Konstantin Kuzminsky, Yuri Miloslavsky, Grigory Kapelyan, Alexei Tsvetkov and Genrikh Khudyakov, as well as younger poets—Galper, Vasily Lomakin and others,” said Igor Satanovsky, a poet and the journal’s editor. 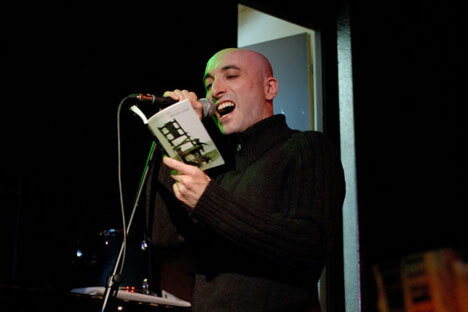 Konstantin Kuzminsky, who now lives in New York State, has played a pivotal role in forming a community of Russian poets in the past quarter century. He left the Soviet Union in the early 1970s and quickly achieved notoriety in the émigré milieu. He has appeared in a number of documentary films, and is known for compiling a multivolume poetry anthology, “The Blue Lagoon.” He spent years on the anthology, which has indeed saved many talented Russian poets from oblivion. Kuzminsky became the center around which a circle of Russian poets, prose writers and artists gathered; the Russian literary and performance salon included Alexander Kogan, Igor Satanovsky, Alexander Galper, Mikhail Magazinnik, Dmitriy Romendik and others. Small-print literary journals (“Magazinnik,” “Vydavy,” “Chlensky” and others) were produced, and poetry performances of a new kind were organized. Kuzminsky lived for a time in Brighton Beach, and every morning he would walk outside wearing a cloak and astrakhan hat to walk two huge, sleek Russian Borzoi dogs, which look very much like Greyhounds to Americans. He was known for his larger-than life quality on the boardwalk—as well as his larger-than-life poems. In the early 2000s, Kuzminsky bought a house in the Catskill Mountains on the banks of the Delaware River, in the wilderness on the border between New York and Pennsylvania, where it looks like the heroes of Fenimore Cooper never moved on. Russian artists and literary figures have made pilgrimages to this desolate location, only to be greeted by a modest, two-story house with a broken-down airplane on the roof, a Maxim gun (without an ammo belt) in the room and a collection of weapons from the Tuareg nomadic tribes on the walls. Kuzminsky, disheveled and with a scraggly beard, wearing nothing but a robe, would be drinking French cognac. He would reluctantly make himself vertical. In the past, Russian literature in exile was both distinct and disparate from Russian literature at home. There was still a memory of the Soviet Union and the Iron Curtain, and the division of life in two: before and after emigration. But a unified media landscape has gradually evolved on the Internet. Emigré writers frequently travel to Russia, and the Russian literary life that was distinctly American has, for many, faded away. The community of Russian poets in the U.S. is small, but rifts within it are common—especially lately. Poets are vehemently reacting to the latest political events. For example, “Novaya Kozha” ("New Skin") co-editor Leonid Drozner recently resigned from the editorial board. One of his reasons was disagreements about the Russian-Ukrainian conflict. At the same time, more writers from Russia are published abroad, and more emigré Russian-language authors are published in Russia. Fewer poets immigrate to the United States, yet exchanges are more important than ever. The poets who are now coming to America are doing so more to conduct business than to emigrate. Poet and literary critic Dmitry Kuzmin is spending the spring semester 2014 teaching at the Slavic Department of Princeton University in New Jersey. Bakhyt Kenjeev lives in Montreal and New York as well as Moscow; and there are many other examples. Unlike a few decades ago, many of these poets want to be perceived, first of all, as Russian poets—not diaspora or exile poets.